Mission Statement: The Lafayette Parish Master Gardeners Association, Inc. assists the LSU AgCenter in educating Lafayette and surrounding areas about horticulture and environmental stewardship through the transmission of factual, research-based information. Ask A Master Gardener table. The Lafayette Parish Master Gardener Program is accepting applications for the 2019 class. The application deadline is May 31, 2019. The MG program consists of an informative course of study in basic and applied horticulture. 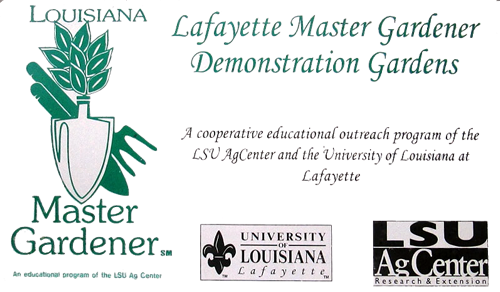 Instruction is provided by LSU AgCenter Extension faculty and other horticulture experts. Classes will be held once a week from August 2019 through November 2019 at ULL's Ira Nelson Horticultural Center on Johnston Street in Lafayette. Applications can be found on the LPMGA website, or obtained by calling the LSU AgCenter office –LPMGA Program 337-291-7090 or by emailing Dan Devenport, Horticulture Agent, DDevenport@agcenter.lsu.edu. Garden in Youngsville to help solve a problem. With our rainy weather there are many days of the school year when Ms.
Hannah LeBlanc’s third grade class cannot get to the garden. 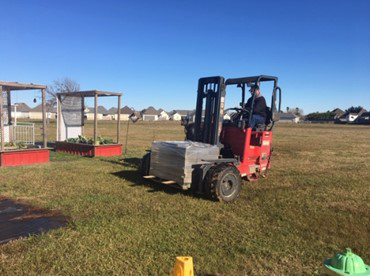 Right before Christmas break Lowe’s delivered 180 - 12x12 inch cement stepping stones/pavers. We met up to lay them out around our garden tubs. We laid a path around the tubs for easy and dry access. Then we laid a path from the sidewalk near the classroom to the garden. The children and Ms. LeBlanc were very appreciative! !